Santa Maria Needs Etta Waterfield! Public Safety means safe neighborhoods and a thriving business community. Etta will continue to ensure our First Responders have the tools needed to carry out their missions of keeping our community safe! When Etta first became a City Councilwoman in 2014, we had 15-20 fewer police officers assigned to patrol than we have today. The City installed surveillance cameras that have been not only been successful in cutting down crime but have also helped our Police Department identify and arrest the criminals who have preyed on our citizens. 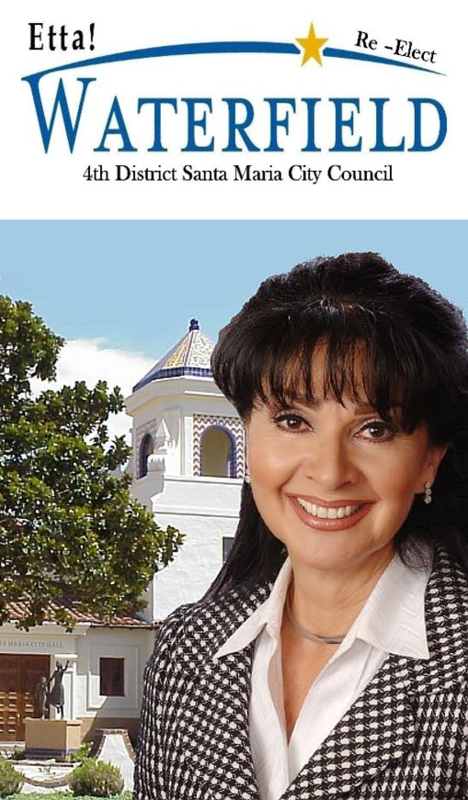 Our Santa Maria Police Department executed Operation Matador during Etta’s first term as City Councilwoman with meticulous professionalism and successful results. Our Community-based Policing Policy needs to continue. Public safety is always at the top of Etta’s list. Jobs Opportunities and the Economy Government doesn’t create business, but rather creates an environment for business to flourish. The city has streamlined policies that do not obstruct business, making the city of Santa Maria “Business Friendly.” Etta believes we need to make it even better and continue to attract higher paying jobs. By supporting our local businesses, we create an economically rich environment that is vitally important to our City and Quality of Life! Revitalize Downtown First and foremost, the Downtown District has to remain a safe place to live and work. The Downtown Friday Nights program has been a true success, enjoyed by all age groups. Etta will also continue her efforts on the “Revitalize Downtown Committee” by creating more incentives to enhance local businesses and attract new ones to Downtown. We have received two grants, one to create a vision for our Downtown, and another to bring that vision to life. A proven track record in economic development and creating higher paying jobs. A hands-on approach to public safety. A commitment to providing affordable housing, educational opportunities, senior resources and activities, youth recreation, and creating a good quality of life for all citizens of Santa Maria. If you have any questions or comments, please contact Etta at www.electetta@gmail.com.